Lionel Messi faces three weeks on the sidelines ahead of Manchester City’s visit to the Nou Camp in the Champions League after tearing a muscle in Barcelona’s 1-1 draw with Atletico Madrid. Messi will miss his team’s next two home games in La Liga as well as their visit to Borrusia Monchengladbach next Wednesday. He will stay in Barcelona during the international break and should return on October 15 against Deportivo. Four days later Pep Guardiola will be in town for the first of City’s double header with Barcelona in Champions League Group C.
‘Without Messi football loses but we have the squad to cope as we did when he was out last year,’ said Luis Enrique. City will hope the Barcelona forward, who has torn the abductor muscle in his right leg, returns rusty and not refreshed as they take on the Spanish champions pegged back here by an intense Atletico Madrid side who look ready to play a big part in the title race this season. Diego Simeone has still never beaten Barcelona in the league but he won’t let that spoil his journey back to the Spanish capital. This 1-1 draw was Barca at times at their brilliant best but it was also Atletico telling the world they’re not going anywhere either. Simeone’s team fell behind to a first half goal from Ivan Rakitic, but the game changed in the second half when Messi hobbled off and Angel Correa scored the equaliser. They might have taken all three points had Marc-Andre ter Stegen not tipped Diego Godin’s header just over his bar late on. In the end it was an unstoppable force against an immovable object – two clubs who will go the distance in this season’s title race and on this evidence, take some beating in the Champions League too. 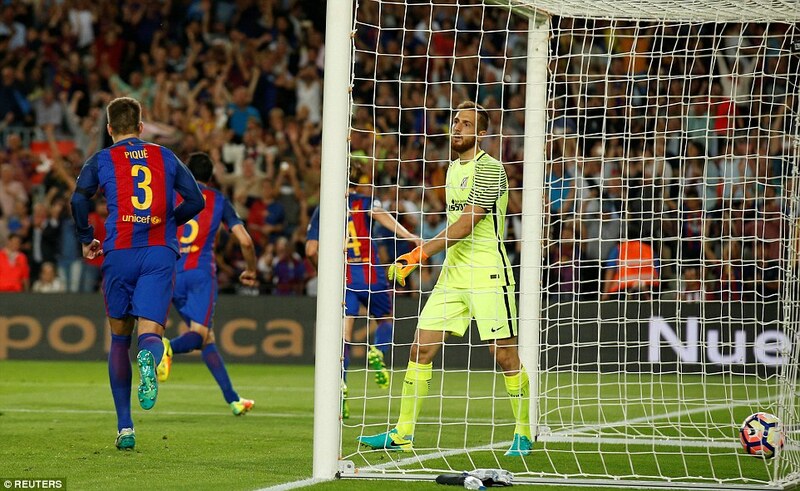 Barcelona’s first chance fell to Messi whose shot from distance after a Neymar dribble was gathered safely by Jan Oblak. But home chances were few and far between because Atletico were so well positioned and so quick to every challenge. They were good on the break too and a Yannick Carrasco run and shot meant Ter Stegen had work to do. 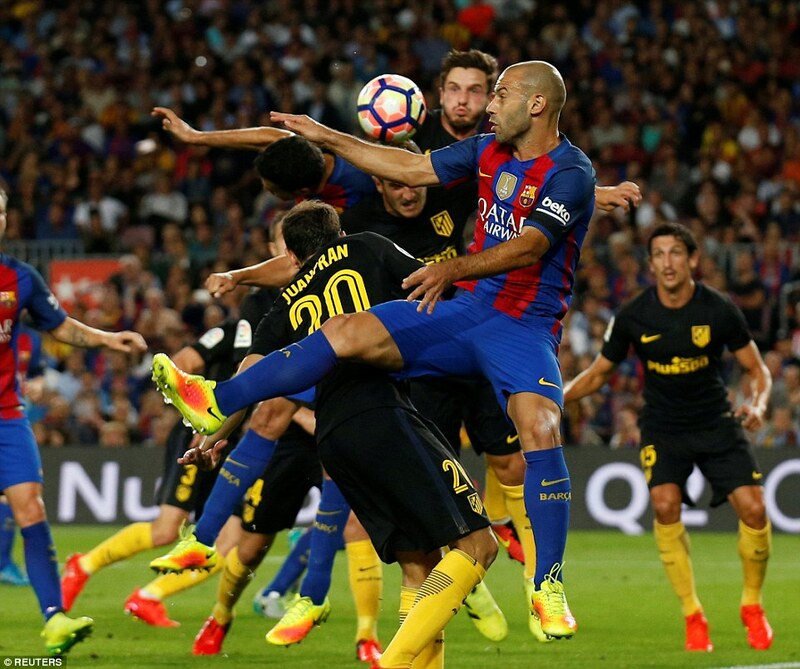 Javier Mascherano made a vital interception to stop Kevin Gameiro meeting an Antoine Griezmann cross and even Andres Iniesta had to sprint 50 metres back to make a goal-saving clearance. Iniesta was everywhere and would feature for the goal but the strike that broke the deadlock was to be a while in coming as Atletico’s counter-attacking machine continued to purr in the first half. Griezmann was at the heart of everything. It is not difficult to see why clubs such as Chelsea would love to sign him. He was dropping off to link the play, using his pace to get in behind, and he even beat Gerard Pique in the air. Barca were so frustrated by Atletico’s exceptional defending that Iniesta was reduced to playing earlier diagonal balls into the box. Ironically enough, it was from one such longer pass that the goal came. He picked out Rakitic’s perfectly timed run and the Croatian international headed past Oblak and into the net. 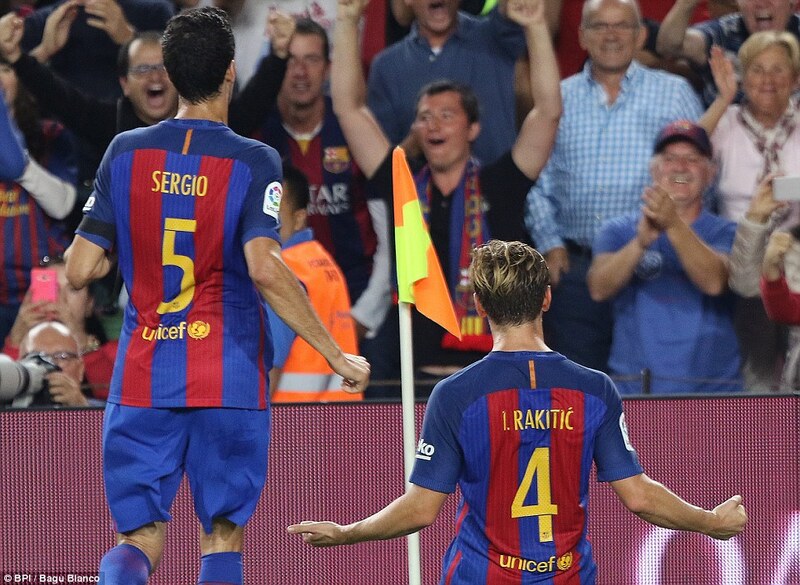 Rakitic is very high up the queue for a new contract at Barcelona and this goal was another reminder of his huge worth to the team. Coming just three minutes short of half time it was cruel on Simeone who had run up a sweat in, and often out of, his technical area. He had done his best to help his team maintain their impressive level of intensity but Rakitic’s guile and Iniesta’s perfect delivery had done for them. The latter has now made at least one assist in each of the last 14 La Liga seasons and he continued his recital in the second half with a perfectly floated pass for Neymar to run onto as Barca sought their second goal. When the next goal came on the hour it was not scored by Barcelona, however. Fernando Torres and Correa had come on for the visitors and they combined for the equaliser. Torres provided the assist with a lovely drop of the shoulder that allowed the ball to run past Pique. Then there was a not so lovely drop of the shoulder from Mascherano as he slipped and went to ground allowing Correa to score. The game had completely changed, and not just because of the goal. Messi had limped off moments early to be replaced by former Atletico midfielder Arda Turan, this coming after Sergio Busquets had also left the field injured five minutes into the second half. Barcelona had to find a second goal, and they had to do it without Messi going forward and without Busquets protecting the defence. A brilliant double-tackle from Pique prevented Carrasco getting away down the left and Neymar flashed a shot just wide as the clock ticked down with a slightly more nervous Atletico now picking up yellow cards. Koke was cautioned for a foul on Luis Suarez and substitute Thomas followed him into the book for a foul on Neymar. 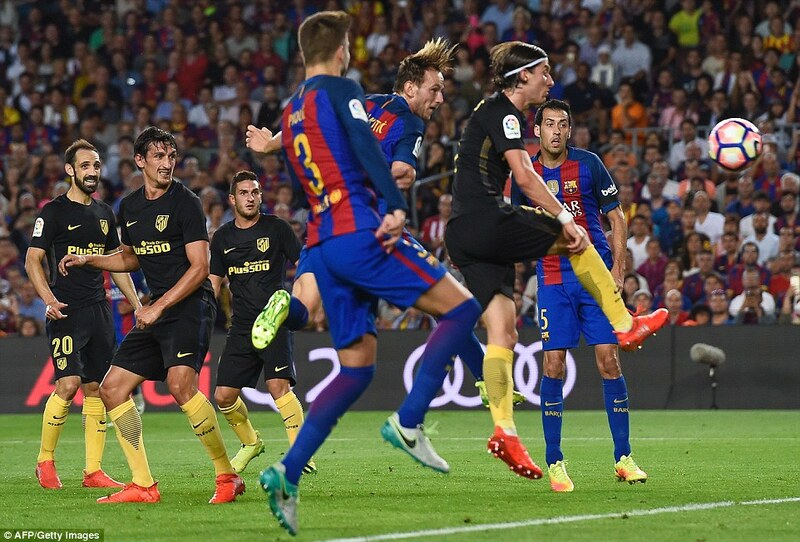 From the free-kick that came from that second offence, Pique headed agonisingly wide. With three minutes added time shown on the board, the Nou Camp groaned knowing the winner was unlikely to come. Simeone continued to duck and dive in his technical area, directing his defenders and willing his forwards on through the final seconds. He remains winless here but he will have left feeling like a champion after taking what could be a precious point in the title race. It’s a race in which his team look like playing a full part.